“It is events and experiences like the DAE Golf Classic that drive further engagement of timeshare owners and keep occupancy levels of timeshare resorts up near an average of 90%* year round. Worldwide timeshare exchange company, DAE, is hosting its second annual DAE Invitational Golf Classic in Taupo, New Zealand, from 10th to 14th May. It follows on from the success of last year’s inaugural tournament, which saw around 70 local and international players take part in the 5-day friendly tournament, with close to 100 expected this year. 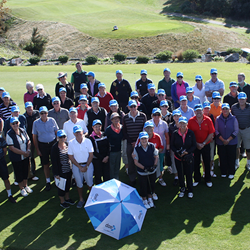 “Our inaugural Golf Classic in May 2014 attracted DAE members from as far as Perth to take part in the unique friendly competition, which is fantastic for the Taupo region,” said DAE’s Regional Manager, Australia New Zealand, Gary Fog. “We’re bringing back the 9-hole format, which proved to be extremely popular with the players last year, as well as introducing an 18-hole Ambrose on Sunday to kick things off. “Importantly, the 9-hole format allows plenty of time to soak up everything else on offer around the local Taupo area, including lake and river cruises, fishing, glass blowing, and other activities. The peak timeshare industry body, the New Zealand Holiday Ownership Council (NZHOC), has again put its support behind the DAE Golf Classic. “The timeshare industry contributes over $10 million in expenditure by resorts and guests to the Taupo region annually,” said NZHOC Chairman, Martyn Rix. DAE has grown significantly since it first opened its doors in 1997. A strong focus on quality customer service has led to their continued growth as over 50% of their new memberships have been the result of personal referrals. Today, the company services over 1 million timeshare owners (including 550,000 direct members) at resorts and clubs through 10 offices worldwide, and is a truly viable option for all timeshare, points and fractional owners to exchange their weeks and points or credits products. DAE’s robust set of membership benefits makes it easy for owners to truly enjoy their vacation ownership experience. Their simple, flexible and innovative direct to consumer approach has evolved into a range of business development and support tools for their business partners such as resorts, management companies and Home Owners Associations who are looking for a competitive edge to support their rapid growth.